Home > LED Dome Lights with Switch > FriLight 87072 Spot Gyro LED Dome Light with rocker SWITCH, 12 volt - 24 Volt (10-30vdc). Recess Mount. Multiple LED bulb choices. ROCKER SWITCH. Screw Mount. Dry location only. Operating Temp: -4 dg F~104 dg F. LED Color Accuracy 80. 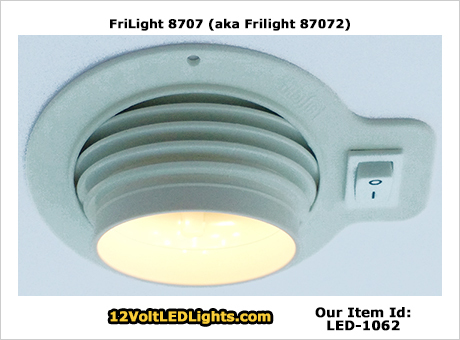 The FriLight 8707 (aka 87072) is a plastic light fixture with a swivel eye and Rocker Switch. This recess-mount 12 volt/24 volt LED light includes an energy efficient Bee Green LED Bulb with fuse and transient suppressor to protect against current overload and voltage spikes. Choose LED bulb color - choose one: Warm White, Cool White, Red, or Blue. OR choose a Bi-Color bulb* in Warm White/Blue or Warm White/Red. Dimmable with our EF1206 LED Dimmer. Bought the LED's to replace conventional light fixtures on my Catalina 42 sailboat. They are easy to install, fit perfectly, provide excellent light. I'll be ordering four more to replace the remainder of my fixtures and have already recommended them to several other Catalina 42 owners in our marina. Thanks for a great product at a good value, that shipped very quickly. FriLight 8780 Comet 12 Volt LED Adjustable Dome Light with Switch (10-30vdc). Plastic Recessed Light with Glass Lens. 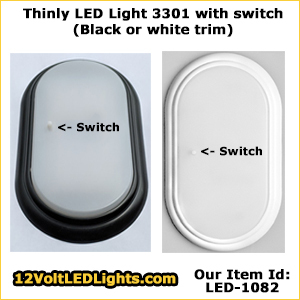 Choose 3-way LED, 190 Lumens Cool White, 170 Lumens Warm White, Red, Blue, Bi-Color LEDs. Chrome or White.